Network is a medium that connects multiple computer systems with a common link. Computer networks are categorized into three basic types based on their size, distance coverage, data transfer speed, and their reach: Local Area Network (LAN), Wide Area Network (WAN), and Metropolitan Area Network (MAN). Let’s study each of them in detail and compare them on various grounds. LAN, acronym for local area network, is a limited area network that interconnects computer systems and their associated devices within a distinct geographical area such as a building, office, university campus or a commercial establishment. It can be wired or wireless or a combination of both and the devices within a network are connected via Ethernet cables. It is the most common type of data network composed of interconnected computers and workstations, and peripheral devices such as a printer. WAN, acronym for wide area network is a broad area network of interconnected devices which are not limited to a room, building or campus; in fact, it extends to a large geographical area such as across cities, countries, or continents. The networks are established using leased telecommunication circuits and a router is typically used to connect a LAN to a WAN network. The best example of a WAN is the Internet which connects many smaller LANs and MANs through ISPs. MAN, short for metropolitan area network, is a data network designed to combine local networks usually confined within the city limits. In terms of data coverage, it spans a larger geographical area than the LANs but smaller than WANs. They are high-speed connection networks that interconnect several local area networks into a single large network with a common bridge called backbone lines. The diameter of such a network can go up to 100 kilometers and they don’t belong to any particular organization. A local area network, or LAN, is a network of computers and network devices connected together, usually confined to a single room, building, residence, office building, or university campus. A LAN is a link that connect a network of computers and it can be either wired or wireless or a combination of both. 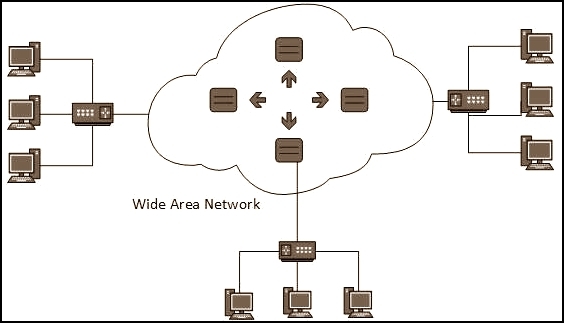 A wide area network, or WAN, is a telecommunication network or a computer network that interconnect multiple LANs and spans a wide geographical area. 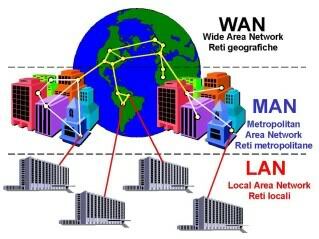 A metropolitan area network, or MAN, is a much larger network that connect network of computers spanning a geographical area larger than a LAN but smaller than the area covered by a WAN. A LAN acts as a stand-alone network that connects computers and workstations through standard Ethernet cables. Some wireless networks are often established using Wi-Fi. While Ethernet is the most commonly used LAN that controls how data is transmitted over a LAN, Wi-Fi uses radio waves to connect computers to a network. 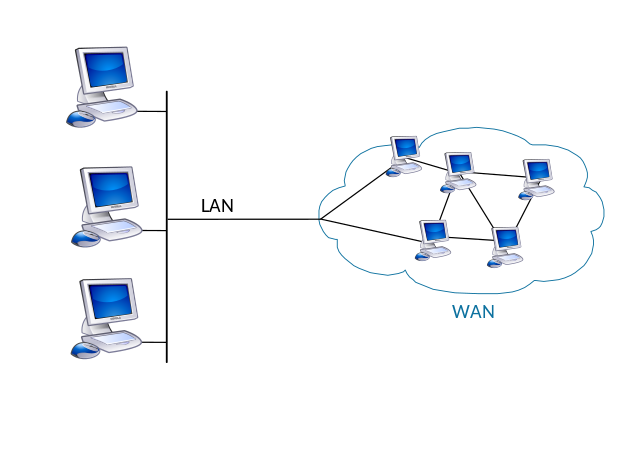 A WAN connects several LANs to establish a network that allows users in one location to communicate with users in another location. It is limited to an enterprise or an organization. A MAN interconnects several LANs into a single large network by bridging them with backbone lines. A LAN is a high-speed connection network with higher data transfer speeds. Most connections are Ethernet with speed up to 10 Mbps or Fast Ethernet with speed up to 100 Mbps. To achieve even higher transmission speeds Gigabit Ethernet is used which can go all the way up to 1000 Mbps. WANs are mostly telephone systems which suffer from low transmission speeds due to network congestion and can be somewhere between 10 to 20 Mbps. It covers relatively a larger geographical area which accounts for a moderate data transfer rate which can go up to 100 Mbps. A LAN is usually limited to a building and the area it covered based on its physical architecture. As they are not particularly designed for long distances they have a limited coverage in terms of distance covered which can be in the range of a few hundred meters. WANs typically span a large geographical area which is virtually limitless, usually in 1000 kilometers and the range can be extended using repeaters. MANs connect multiple LANs in a common geographical area which can be in the range of up to 100 kilometers or sometimes more. Apart from computers, there are essentially some basic components required to establish a local area network such as network adapter cards, network cables, hubs, repeaters, switches, bridges, routers, network server, and LAN software. The three basic components of WAN include customer premises equipment (CPE) such as routers, access links which can be wired as well as wireless and network core which connects CPEs using access links. The primary components of MAN are bridges, access points, directional antennae (semi-directional and highly directional antennae), workgroup bridges, etc. This article explains the three most common and popular types of networks used to link multiple computer systems via a network bridge: LAN, MAN, and WAN. These are the major types of network designed to establish a network within the area they cover. There are similarities and differences between them. One of the major differences is of course the geographical area. Local area network is usually a building or a campus with a very limited distance coverage of up to a few hundred meters, metropolitan area network is relatively a new class of network which extends beyond the area of a LAN but smaller than that of a WAN. Wide area network covers a huge geographical area in the range of up to 100,000 kilometers. Sagar Khillar. 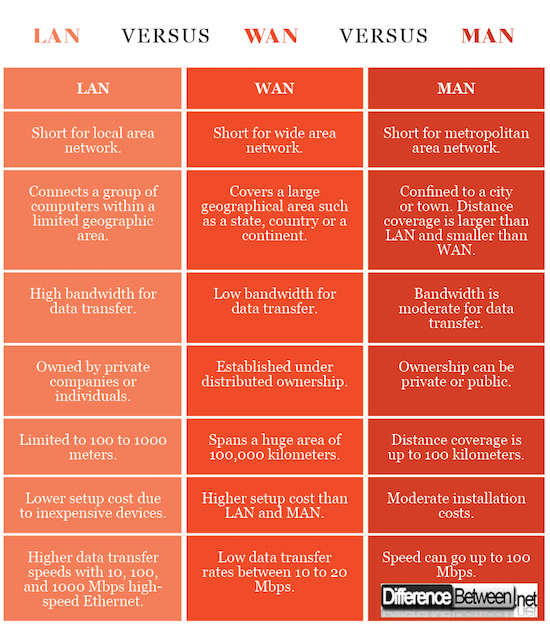 "Difference Between LAN, WAN, and MAN." DifferenceBetween.net. May 1, 2018 < http://www.differencebetween.net/technology/difference-between-lan-wan-and-man/ >. Not to be confused with Wan Pan Man, which is the Japanese spelling of One Punch Man.